Jacobs Hammer is a new film from first time director Angie Boltler. It’s a film small on budget but big on other levels. It centers around a young mother named Sadie, played wonderfully by Helen Holman, who is convinced her young son is pure evil. She even talks to a priest in the beginning, in what I must say is a well-crafted scene asking if someone can be born evil to which he replies “There are always Abels out there” referencing Cain and Able of course. Turns out Sadie is right to be worried. He creepy little kid who is a cross between Damien from the Omen film and Wednesday Adams never really speaks, has a weird evil look about him, and always seems to be holding a hammer. He does this so he can smash people’s heads in. 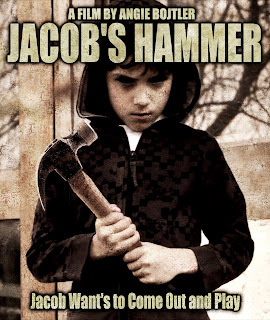 Get it Jacobs Hammer. He has a Hammer and he kills people with it. Anyway what follows is actually a well written and well filmed picture. I enjoyed the technical aspects, i.e the lighting and the effects. The film, as I said is by no means big budget but it knows how to effectively use what it has in its favor. The kill scenes are especially effective. Sewn lips, hammers to the head, all well done. The music that plays through has a nice creepy vibe to it, and it even has a nice 11th hour turn to it. Another thing I have to say that was refreshing is the ending. No, Im not going to give it away here, nor am I going to give away the plot twist, but let me say in today’s market of horror films it’s always nice to see a film end a bit differently. Another thing I must point out is overall tone of the picture. Its not really a slasher, not really a horror film, not really a psychological film. What it is, is a very effective combination of the three that wouldn’t have been pulled off without Helen Holman’s performance. I looked her up on IMDB and see she has been in a few films I have not seen, but you can be sure I will check them out now. She is able to play the character of Sadie to perfection, and as the film progresses you watch her character morph into something that goes from terrified, to terrifying. Unlike most modern films where you could care less who lives or dies you actually feel sympathy for her character and become vested in her plight. Overall I would give this a good recommendation. Great acting, story, and enough gore for the horror fans make this a winner. What I am saying is Forget about Jacobs Ladder, this Jacob has a Hammer!